As part of a major spring cleaning operation that we started the first week of January, this week I opened the last two boxes left over from when we moved into our current house. One of them had a bundle of framed art. I knew most of what was in there before I opened the box, but I had somehow completely forgotten about this. I must have gotten it framed in late 90s, and it hung on the walls of our apartments in Norman and Santa Cruz. At some point it went into a box, and I forgot it even existed. This is the first technical drawing I ever attempted of OMNH 53062, which would later become the holotype of Sauroposeidon. I drew it for my poster at the 1997 SVP meeting in Chicago, and it went on to become Figure 5 in my undergraduate thesis (which is preserved for posterity here). I’d do other, better drawings of the specimen in later years, but this one came first. I know I’m biased, but that second vertebra in the preserved series, which I interpreted as C6 back when, will probably always be the most gorgeous natural object on the planet in my book. I don’t expect anyone else to feel the same. I worked on that specimen for three years – some of it seeped into my soul, and vice versa. Then again, I don’t care how jaded you are about long vertebrae, that one is still a pretty arresting sight. 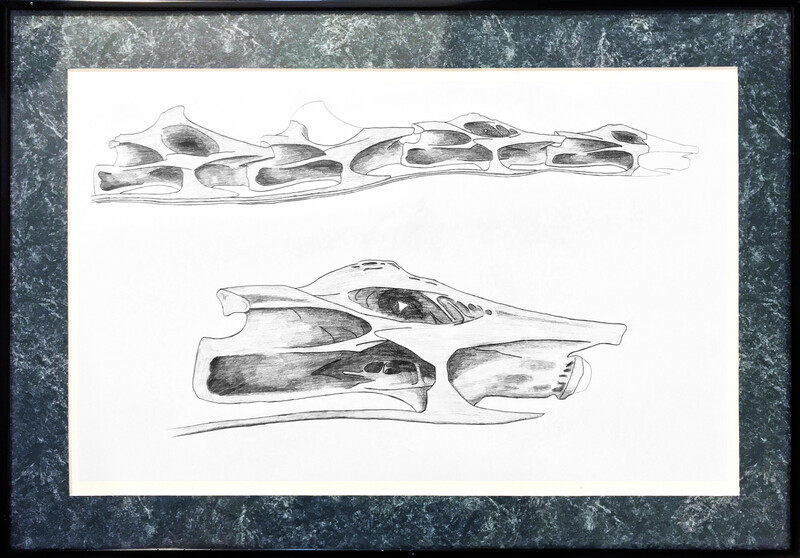 For a much more recent take on the appearance of the Sauroposeidon vertebrae, see this post. It is a little off topic, but could you tell me what is the latest scientific consensus on hadrosaurs stance: they were quatrupeds, facultative bipedal or mainly bipedal. Recently I have recently watched a documentary about a mumified hadrosaur described as bipedal. So my question is if the hadrosaurs were quadrupedal or bipedal. I don’t know of recent research on this, but (A) I don’t think there’s any reason to assume that all hadrosaurs necessarily had the same behaviour, (B) the limb structure of the ones I’ve seen all indicate facultative bipedalism. But you really want Ornithopod Manual Phalanx Picture of the Week, not SV-POW!. « How crazy are the cervicals of Mendozasaurus?